As of last week, D-Rev has received 120 enquiries about the knee, called ReMotion, that mention Donaldson’s TED Talk — either from people in need of the knee themselves, or offering to distribute it to those who need it. 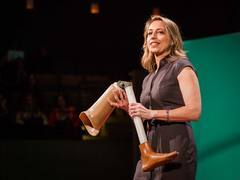 For example, requests have come in from amputees in Algeria, India, Uruguay and Pakistan; from distributors in Egypt, The Philippines and Mexico who are interested in selling the knee; and from prosthetic clinics in Bosnia, Cambodia and Tanzania interested in fitting people for ReMotion once it becomes available. The knee is expected to begin shipping in the fall. For amputees — and friends and family members — who write in, D-Rev plans to keep them updated via email. Donaldson says, “We have all of their information, and we’re actually going to be sending out the first note pretty soon. It’s basically — this is the timeline we’re on, this is how you can get more information, here’s some resources in the meantime.” These emails will be targeted by location, so that a person gets accurate info on when ReMotion will be shipped to their area. But it’s about more than the product. In this in-between stage, D-Rev sees its mission as connecting people who write them with clinics, where they can receive care now and where they can eventually be fitted for ReMotion.